Don’t let the attempt of a hacker, phishing or malware interrupt your online journey. The online world is not foolproof, there are hundreds of ways to disturb the website and DDoS, Distributed Denial of Service is one among them. It has emerged as one of the most frequently used attacks by the cyber criminals. It is mostly used against public websites, bank website attack is one of the most popular and frightening attacks by cyber criminals. The DDoS attack makes online service unavailable by crowding it with heavy traffic from multiple sources. In DDoS multiple Trojan infected systems are used , to attack a single system resulting in a Denial of Service (DoS) attack. In DDoS attack, the flooding traffic originates from hundreds or thousands of sources as a result, it becomes almost impossible to stop the attack by blocking few IP address. 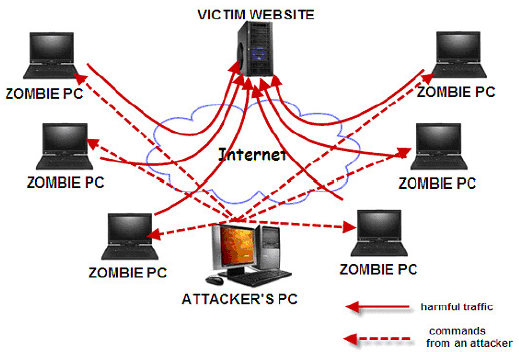 Traffic attacks: The victim website get a huge volume of traffic from attackers, they send a huge volume of TCP, UDP, and ICPM packets to the target and sometimes they carry malware to infect the victim. The Legitimate requests get lost between the heavy traffic. Bandwidth attacks: This DDos attack sends loads of junk data towards the targeted website. The flood of junk data cause loss of network bandwidth and equipment resources and this leads towards to a complete denial of service. Application attacks: Application-layer data messages can diminish resources in the application layer, and it makes the target’s system services unavailable. The average cost of one minute of downtime due to a DDoS can cost up to $22,000. The cost of loss depends on many factors, such as your business segment, the volume of online business, competitors, and your brand. Protect your business against DDoS attack with Cloud Flare. Cloud Flare counter and fix DDoS attacks, including those that target UDP and ICMP protocols, SYN/ACK, DNS and NTP amplification and Layer 7 attacks. use our DDOS protected Hosting and protect your website from all kind of attacks. We have our own premium firewalls which can protect your websites from an attack of up to 40GBPS. So, sign up now with us and move your website to our servers.